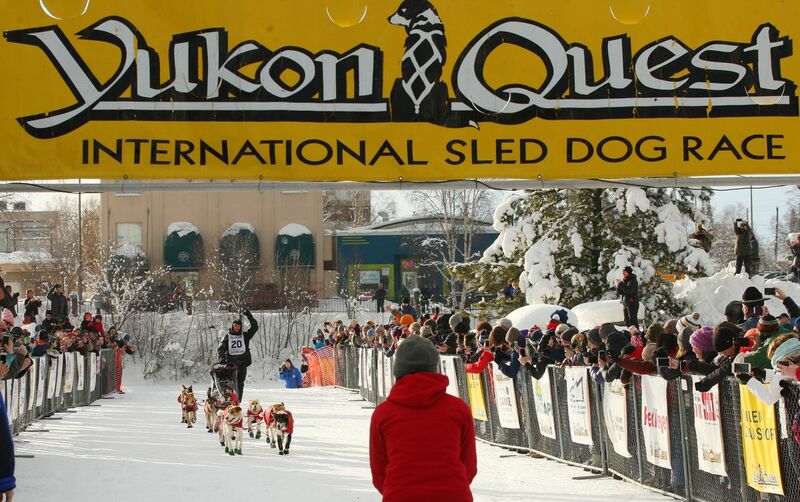 FAIRBANKS — Unchallenged in the final stretch, musher Matt Hall of Two Rivers polished off a dream run Tuesday to claim a win in the Yukon Quest International Sled Dog Race. In a sport where much can go wrong, everything seemed to go right for the 25-year-old, who dispatched a trio of former champions with seeming ease, cruising across the finish line just after noon as a crowd of a few hundred people cheered. Due to thin ice on the Chena River in Fairbanks, the finish chute was moved to a parking lot behind the nearby Big I bar. There was a hint of sunshine and temperatures in the teens. Hall patted each of the dogs in his team and talked to them before greeting his parents, his girlfriend and other supporters at the finish. They brought roses for Valentine's Day, one for each dog, and sirloin steaks for all. Hall's reward will include a prize of $22,716. The Quest began Feb. 4 in Whitehorse, and Hall didn't take the lead until a week later. Thursday, he was the third musher to reach the halfway point at Dawson, trailing 2015 champion Brent Sass by nearly six hours and 2016 champion Hugh Neff by about 90 minutes. Hall steadily gained ground behind lead dogs Anchor and Hamlet. On Saturday, during the 160-mile stretch between Eagle and Circle, he passed Sass, who dropped out of the race the next day. "This is one of those years where we hit it square-on perfect, and those other guys had a couple of down spots out there that cost them some time," Hall said. He said the toughest part of the race for him was at Birch Creek, after he had made a 100-mile run and left sometime after midnight following an hour or so of sleep. He said the dogs were in top condition and eager to run, but he had to fight off exhaustion to get back on the trail. Hall said he does not carry a thermometer on his sled because he doesn't want to know how cold it is when the weather is severe, though he can sense it from looking at the dogs. "It's very true that the dogs feed off of you. When you're at your highest, the dogs are going to do the best," he said. It wasn't until he reached the checkpoint at Central that he realized he was more than two hours ahead of anybody else. "I was surprised to find out that there was quite a spread at that point," he said. His dad Wayne, a Quest veteran, was thrilled to see his son cheered. "I wouldn't want to be anywhere else right now," Wayne said. The younger Hall said he left Alaska for a time a few years ago, but when he returned he knew he wanted to follow his dad and race the Quest. "The best that I ever did was 10th," Wayne said. "The first time he ran it, he was third. Every generation's a little bit better right? He's a whole lot better." 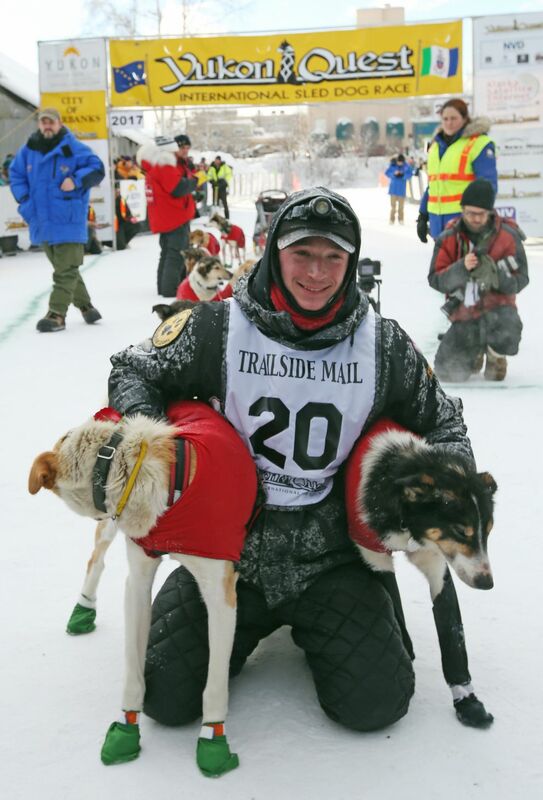 Although the younger Hall said he loves the Quest, he hopes to run the Iditarod in the future. Ideally, he'd run both races every year, something that's common than it used to be. Sass, the frontrunner for more than half of the race, scratched Sunday evening in Central, the checkpoint after Circle. By then Neff was no longer in contention, and so for the last two days of the race, Hall was able to move at a relaxed pace, with his dogs getting snacks of beef or hot dogs every hour. "I couldn't believe it, I had to say one command the entire way from Two Rivers," he said. "They're healthy, they're happy." At 25, Hall becomes the second youngest winner in race history behind Dallas Seavey, who was 24 when he won in 2011. 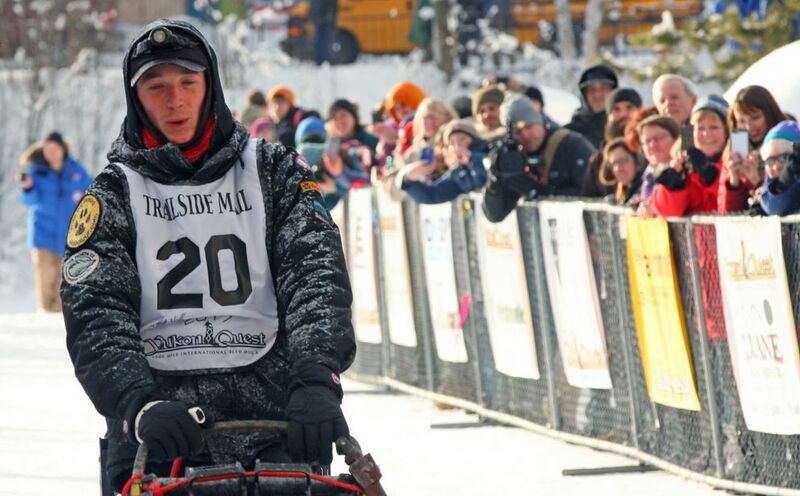 He's the first Quest winner who is also a second-generation Quest finisher, and he and his dad are the only father-son team to win the "Challenge of the North Award" given to mushers who best represent the spirit of the race. Greeting Hall at the finish line was Keeper, who has long been the main lead dog in Hall's kennel but who is nearly 9 years old. Keeper got hurt during the race and Hall dropped the animal to keep him healthy.